Waveform generators (also called function generators) are useful for testing and debugging circuits. I often use them to test the frequency response of electronics components like op amp and sensors. This waveform generator is powered by an Arduino. It outputs four waveshapes: sine, triangle, pulse, and saw, each waveshape ranges in frequency from 1Hz-50kHz. The frequency, pulse width, and overall amplitude (gain) of the waveforms is controlled by three potentiometers. I've also included (optional) indicator LEDs that let you know which type of wave is currently being sent to the output. The Arduino Proto Shields are a convenient way to attach circuits to an Arduino, but I like to trim them down a little bit first so they do not take up so much room in the project enclosure. Start by trimming the pins down with a pair of wire cutters. Next, cut off the six pin socket. Finally, cut the sockets from the top of the board. I cut out shapes of all four waveforms in the front of the enclosure so that I could backlight them with indicator LEDs, you may choose to just drill four 5mm holes for these LEDs in the front panel of the enclosure, place one LED under each momentary switch. Also include a rectangular (11mm tall, 12mm wide) cutout somewhere on the side of the enclosure for the arduino's usb port. I made my project enclosure out of wood, so I had to glue all the pieces (except the bottom) together with wood glue. I will attach the bottom panel on later in this instructable. Solder a 10kOhm resistor to one lead of each of the four push buttons. As shown in the second image, solder a green wire to the junction between the button and the resistor and a red wire to the other end of the resistor. Solder a black wire the the second lead of the push button. It's a good idea to cover these connections with a bit of heat shrink to prevent short circuits (fig 2). Unscrew the plastic casing from the audio jack. Solder a red wire to the two stereo out pins and solder a black wire to the ground pin (fig 3). I used hot glue to prevent short circuiting the jack and to give the soldering joints some extra support. Finally, mount the audio jack in the enclosure with super glue. Snap the top of the button off and fit them into the wooden enclosure. Secure with hot glue. Once dried, snap the black button tops back on. Solder eight 20kOhm resistors to the arduino protoshield. One end of each resistor should connect to digital pins 0-7. Solder 7 10kOhm resistors to the protoboard so that they bridge the leads of the 8 20kPhm resistors you have just soldered. Solder a 20kOhm resistor to the protoshield so that one end is connected to the 10kOhm resistor attached to digital pin 0 and the other end is connected to a jumper wire to ground. It's a good idea to use sockets for your ICs, this way you won't risk burning the IC with your soldering iron and you can easily replace the IC if it breaks. Solder an 8 pin socket to the protoboard as shown in the image. Use a resistor and capacitor in series to create a low pass filter. Low pass filters let low frequencies pass through and silence (attenuate) high frequencies. Connecting a low pass filter to the output from the dac will smooth out the steps in the wave. According to Nyquist's Theorum, signals cannot contain frequencies higher than half their sampling rate. If I used a sampling rate of 100kHz, then the highest frequency I can produce is 50kHz. Connect one end of the the 300Ohm resistor to the 10kOhm resistor connected to digital pin 7. Connect the capacitor to the other end of the 300Ohm resistor. The other side of the cap should connect to ground. Connect the positive lead of the 220uF capacitor to the junction between the resistor and capacitor of the low pass filter. The other end of the 220uF capacitor connects to a 20kOhm resistor that is connected to pin 3 of the IC socket. A 4.7kOhm resistor bridges pins 3 and 4 of the IC socket. Connect ground to pin 4 of the IC socket. Connect the positive lead of a second 200uF capacitor to pin 5 of the IC socket. The other end of the cap will be connected to the gain pot in a later step. Connect pin 6 of the IC socket to Vin, pin 2 to ground, and snap the IC into the socket. Volume or gain of the audio signal will be controlled with the 10k audio taper pot with switch. Connect the audio out from the amplifier and ground to either side of the potentiometer as indicated in the picture. The middle is audio out, it will be hooked up directly to the audio jack. Also connect a wire to the bottom and left leads on the back of the pot (figure 2). This is the switch that will be used to connect to power in the next step. Connect the black wire from the battery clip to ground on the Arduino Shield. Connect one lead from the gain pot switch to the red wire from the battery clip and connect the other gain pot lead to Vin on the Arduino Shield. Leave the battery disconnected for now. Connect the output from the amplifier (the negative lead of the cap connected to the IC at pin 5) to the red wire we attached to the gain potentiometer in an earlier step. Connect the green wire from the amplitude pot to the red wire connected to the audio jack. Connect the black wire from the audio jack and the black wire from the pot to ground on the Arduino Shield. Connect a red, black, and green wire to the 10kOhm and 50kOhm potentiometers as shown in the images. Connect the red lead to 5V and the black leads to ground on the arduino shield. Connect the center green wires to analog pins 4 (PWM) and 5 (frequency). Remove the side tab on all of the pots before installing in the enclosure, this will allow them to sit flush against the wood. Remove washer and nut from each of the pots, place pot through hole in enclosure, and secure with nut. Install all three pots in the enclosure. Attach a 470Ohm resistor to the cathode of each of the four LEDs. Solder a black wire to the other end of the resisotr and a red wire to the anode of the LED. Cover these connections with shrink wrap to prevent short circuiting. Solder the black leads from all four LEDs to ground on the arduino shield. Solder the red leads to digital pins 8-11. Glue a light diffusing material behind the wave cutouts in the front panel. I used a piece of a black plastic garbage bag. I stored this array in the Arduino's memory called sine20000 and recalled the values I needed to send to the DAC. This is much faster than calculating the values individually. Plug the Arduino into your shield. Connect a 9V battery to the battery clip. Secure these items inside the enclosure. Make sure that the Arduino's usb port is accessible from the outside of the enclosure. Upon startup you should see the sine wave LED light up. Drill four holes in the back panel and secure with screws. Screw knobs on the three potentiometers. Turn up the gain knob to turn on the function generator. Plug an eighth inch jack into the output and hook up the function generator to an oscilloscope. Test out each of the waveforms and adjust the frequency and gain to make sure they are working properly. Switch the output to pulse and check if the pulse width modulation knob works (figs 4-6). You will notice that the pulse wave is the only wave which truly ranges from 1Hz to 50kHz. Since the sampling rate is 100kHz, the sine, triangle, and saw waves start to become somewhat unrecognizable at about 25kHz (they are only comprised of 4 samples per cycle- 100kHz/25kHz). The saw and triangle waves only go down to about 100Hz, this is because the values of triInc and sawInc get so low that they are rounded to zero below this frequency. The sine wave reaches all the way to 1 HZ but the resolution stays the same for anything under 5Hz, since the Arduino only has enough memory to store about 20 thousand samples. 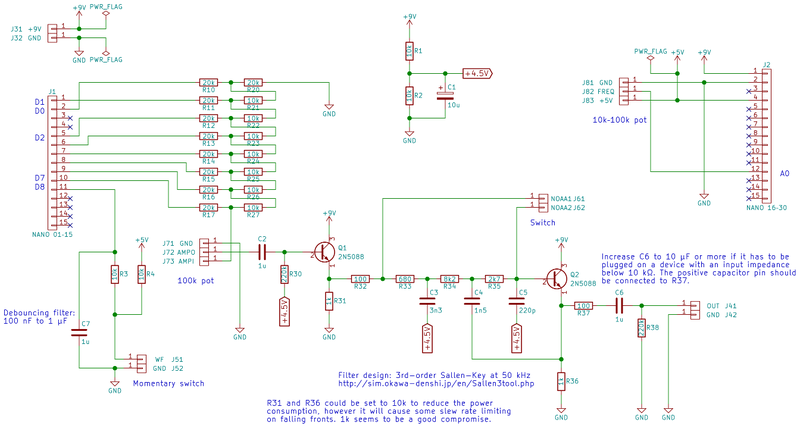 The schematic is at the top, and it shows tat the buttons are pulled high via 10k resistors on the arduino-side. The other end of the button goes to ground. Of course. The nano has the same ucontroller on board as an UNO. Excellent instructable, the function generator works great. However, I tried using a Leonardo, and it is not working as expected, all other parts being identical. Has anybody tried that succesfuuly? Think of a sine wave in the x-y plane. There are only 256 y values available, because that's the resolution of the arduino's analog output pins. However, we can have as many x values as we need, to some extent. So the question becomes what is the smallest number of x values you need for it to still look like a sin wave. The author chose 20k, but you could do more or less if you wanted to. As I see it, the only reason to do more is for higher resolution at lower frequencies, and the only reason to do less is to save storage space. Are you sure of the capacitor value for the anti-aliasing low-pass filter? An R–2R network has an output impedance of R (10 kΩ here) so the 300 Ω resistor is negligible and could be omitted. With a 10 nF capacitor, the cut-off frequency is slightly above 1.5 kHz, which is way too low. IMHO 330 pF is much more suitable, even 1 nF is probably fine. Another important thing is the accuracy of the R–2R resistors. I see you used 5 % resistor which is too coarse. It may lead to significant errors on the most significant bits, causing large unwanted steps and even creating a non-monotonic curve. In my project I used a set of 1 % resistors, and manually matched a few of the 10 and 20 kΩ with an ohmmeter. These ones were installed on the 3 highest bits to make the MSBs as accurate as possible. In the end my project ended quite different of yours: I used a cheap Arduino Nano, I get rid of the interrupts (causing a significant overhead) to poll a 200 kHz timer. The higher sampling rate gave me a better waveform accuracy in the high frequencies, as well as more stability. But I had to interleave pin polling, complicating the code (all integer-based, floating point was too costly). I reduced the sine wavetable to 4096 samples, which is enough with 8-bit data (making it larger doesn’t improve the accuracy in a measurable way). I used a more common linear potentiometer (B-type) for the frequency and did the exponential mapping in software. I built a 3rd-order Sallen-Key low-pass filter for the anti-aliasing, and made it bypassable to allow testing sharp edges with the pulse and saw waveforms (leaving just a single pole to filter out HF above a few MHz). I also used two spare 2N5088 to add simple buffers instead of the LM386. And there is just a single button to cycle through the waveforms, so I could add more of them if I want without changing the front panel. Anyway your design was very instructive (it’s my first Arduino project) and inspiring, and I am grateful for this. What is the 220uF capacitor connected to the 20k resistor and the output of the opamp and then how to calculate the value of these capacitors for higher frequency eg for 1Mhz because I was inspired by your project and I would also build my own generator with that I would have the frequency set up using buttons and also use the LCD display. please anyone can send Waveform Generator full code to my email.. I am new to arduino and I would like to restrict the signal amplitude on my function generator to reflect biopotentials in the range of 10-100 microVolts. Does anyone have any suggestions? Anyone have an idea on the max frequency you can get experimentally? By the way this arduino waveform generator is a just didactic hobby for arduino geeks, unless you expand it (like I will do with presets instead of the potentiometers). If you just need a well working d.i.y. waweform generator, you might want to purchase that kit: XR2206 Function Generator Kit. You get that kit for <8 bucks, with all that you need, including the case. Hi would this work on an Arduino Nano? Can I substitute in a 741 Op Amp in place of the IC? You migt want to consider an Arduino DUE instead. That one is not only much faster, it has two DACs built in, so your soldering will be reduced by 90%. delay(50); // just to slow it down for display! You get a damn good sinus just with two integer additions and 2 divisions.